My Indian culinary experience was definitely a highlight of my trip. I was able to not only try restaurant food, but also street food which was scary but absolutely worth it. You always hear about how traveler’s stomach’s take the turn for the worse when they get to India and I’m glad to say I didn’t have any negative food experiences. One of my favorite memories from the trip was trying some of the street food while waiting for our ride back to our Airbnb. All the stands I saw was full of color with different ingredients and smells. I tried fresh coconut on the street and really enjoyed the taste so I decided to delve in further and eat some potato pancakes. These were fried in a round, flat shape and covered with sauce and other spices. This reminded me slightly of hash browns from back home but a little thicker and crispier in consistency. The taste was both sweet and spicy which was so refreshing after a long day of traveling. During my stay, I also tried some Indian curry takeout which was provided by our Airbnb host. We ordered from the menu and got it delivered to our door a few minutes later. I really enjoyed the naan and roti which are both bread eaten with curry. Back home, I thought Indian food was absolutely amazing, now that I’ve had it in India, there is nothing that can beat actual Indian food. I also noticed the array of vegetarian options in this country. From Paneer items on the menu, to fully veg restaurants, it is such an easy place to be vegetarian. Throughout this voyage, I’ve been thinking about becoming a vegetarian or slowly taking meat out of my diet. After visiting India, converting to vegetarianism does not seem as bad as I thought. I started by cutting beef out of my diet slowly and who knows? Maybe in a couple of months I’ll become fully vegetarian. While in India, I had the opportunity to travel to many different parts of the country including Cochin, Varanasi, Agra, and New Delhi. For the majority of the time in port, I was on a Semester at Sea trip. To my surprise, every single meal we ate was in hotels eating at a buffet. There were always many curry options and my favorite, naan, which I ate for every single meal and quite enjoyed it. I ate at a local restaurant. I ordered buttered chicken and chicken fried rice. At this meal, I decided that I wasn’t going to like Indian food as much as I thought I would. I like being able to see what I am eating and all the sauce on the buttered chicken made this very difficult to see what was underneath. I tried some street foodin Varanasi also. I am not sure how to spell the name of it, but I actually really enjoyed this snack. They take these hallow balls and make a hole and fill it with a chickpea mixture and then pour a green sauce on top. I am not exactly sure what I was eating but it was fun and exciting to try a local Indian snack. 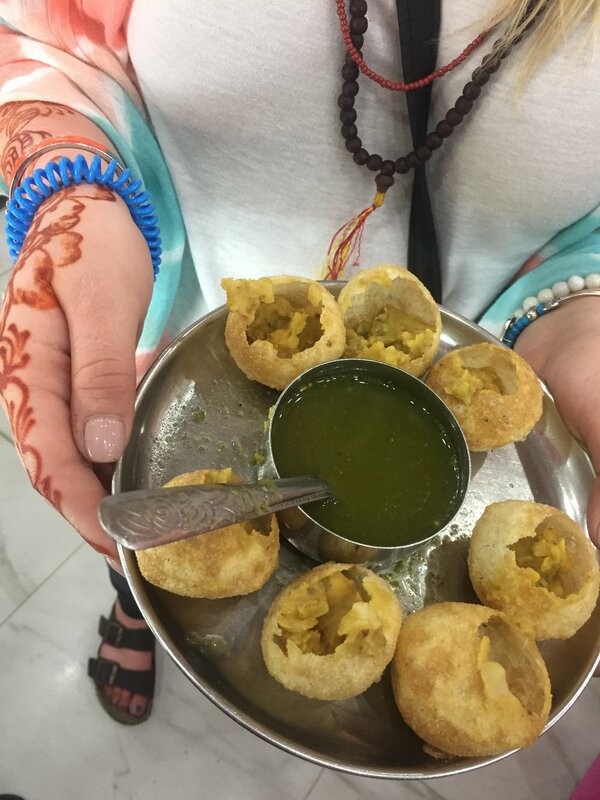 India had some interesting options and I am so glad I got to try a variety of foods while there! Prior to my week in India, Indian food was not my favorite. I’ve always wanted to like Indian food because it is so popular, and I know it is often healthy. After spending some time in different parts of India, I can’t say that I love it all of the sudden, but I have definitely come around to more foods that I like. On my first day in Kochi, my friends and I took a local recommendation for a restaurant in Fort Kochi called Kashi Art Café. We got this tip from a few students in the area. We seemed similar in age and interest, so I was excited for this restaurant, and I was not disappointed. When you walked into the host’s area, there was art plastered across the walls and sculptures in the corners; it made a unique first impression. That area was indoors, but the dining area was outdoors. The space was small, but there was no roof which made it feel quite open. The greenery on the walls and fresh air gave the whole place an earthy atmosphere. The menu was a mix of Indian and Western food. They did not serve any sodas or brand name drinks. They made all their own juices, coffees, and teas. I ordered lamb kheema along with a pineapple/spinach juice. My food was amazing. The lamb consisted of ground lamb with large pieces of garlic toast. The lamb had that southern Indian spice, but it could be balanced with the garlic toast. The juice was tasty and fresh. My friends really enjoyed their food as well. Unfortunately, I wasn’t able to go back into Kochi, but I know that those friends returned to this restaurant later that week. I spent most of my week in Delhi and Agra. In Delhi, I spent a couple days in a village working with students in a government school. On our last day there, we had played with the kids in the yard for an hour or so, and the faculty went out and bought them samosas. The kids were completely silent when they passed out the food because they immediately started eating. We were told that the free lunch is a large reason why parents choose to send their kids to school. While I didn’t eat a samosa, I thought this was an interesting food experience because it plays such a big role in their education system.